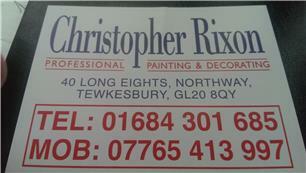 Chris Rixon Painting & Decorating - Damp Proofer, Painter/Decorator based in Bishop's Cleeve, Gloucestershire . I have been a professional decorator over 20 years now and have been a Dulux Select Decorator since 2001. This enables me to guarantee my work through ICI Dulux and along with Checkatrade gives my customers confidence in my work. I cover all Interior & Exterior Decorating, Damp Proofing & Wallpapering.